Thus America began its campaign towards defeating Germany. By following the exhibits around the room and on this site the visitor can track the events of the war in Europe in the sequence they happened, and gain an understanding of what kind of soldiers and weapons that the American GI faced as the war progressed. The ETO exhibit provides a comprehensive collection of the Infantry weapons used by the Germans. From the P-08 Luger pistol, to the MG 42 Machinegun to the 88mm Panzerschreck rocket launcher, it represents a unique opportunity to see all of the basic weapons up close to get a better understanding of what the American soldier was confronted with pn the European battlefield. The ETO display provides a unique view of the war in Europe through original art, images, and militaria of that era. The focus is on the war as it would have been experienced by the average soldier, sailor, or airman. It begins with a glimpse into the propaganda message that the Germans were subjected to, the constant drumbeat of nationalism, sacrifice and glorification of war to promote a warrior culture. 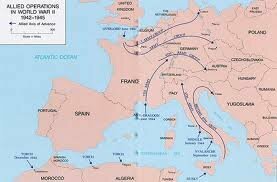 Then through a series of chronological dispalys one can follow the progression of the Allied advance from North Africa, up to Sicily and Italy, the invasion of France and the eventual advance into Germany itself. The outer part of the display follows the German soldier as he would have evolved during the war. From the confident and well equiiped soldiers that the Americans first encountered in North Africa to the old men and children thrown into the final battles of 1945. Just as is the case with the weapons, most of what is seen in the displays are the original uniforms and equipment that were used in that era. The background images are the actual posters, paintings and related images that reflect the continual campaign to influence the thoughts of the German people. . While the Germans were driven to glorify battle, and emulate the great warriors of the past, the American soldier from Blanco County was generally just that, a citizen soldier who was there to get the job done and go home. Many of the uniforms on display here were actually worn by residents of Blanco County in the war.